Rhizomatous Tall Fescue (RTF) is a new type of tall fescue that produces rhizomes. A rhizome is an underground stem that tills through the soil laterally to spread the plant underground and form new growth. RTF behaves like a bluegrass but will survive our transition zone climate like other turf type tall fescues. Available in sod and seed. Unlike other Tall Fescues, RTF has the ability to repair itself. Traditional tall fescue grasses will clump together instead of filling in bare spots, resulting in an uneven lawn. With bare spots, weeds are more apt to take over the lawn. What makes RTF unique is its ability to fill in these open areas with rhizomes. Young plants first build the root and shoot system to sustain life; then concentrate on a bare area of lawn with rhizomes, knitting the lawn together. RTF’s rapid germination ensures a quick establishment of your new lawn. While overseeding an existing lawn, the quick germination allows RTF to compete successfully with the old turf, eliminating the clumps and bare spots forever. 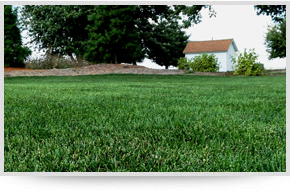 Ordinary tall fescues require maintenance from overseeding, weed problems, and clumping. RTF results in less overseeding, fewer weed problems and no "wide-leafed ugly clumps" of tall fescue plants in open areas. What's the difference between RTF®; and other tall fescues? Is distinguished by the presence of both longer and more prevalent rhizomes than either of the other two groups. What about all these other 'RTF®' varieties on the market? Plants were mowed on same schedule as turf nearby – 3 inches mowing height. Results showed that the RTF sod overwhelmingly produced more rhizomes that any other plant. RTF varieties from Barenbrug produce 20 times more rhizomes per variety than other so-called “Rhizomatous Tall Fescue” varieties. The average length of rhizomes in Barenbrug RTF varieties increases as the plant matures, thus increasing the spread of the plant. The Turf Blue® Pro is a blend of exceptional Kentucky bluegrass varieties, powered by the high NTEP ranking variety, Barserati. This new blend is formulated for a rapid establishment with exceptional turf quality and turf density that provides early competition against weeds and is very disease resistant. 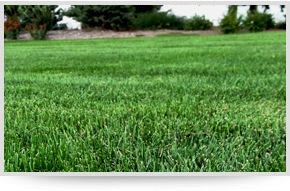 Kentucky bluegrass is a perennial sod-forming grass that spreads by strong rhizomes and seeds. This means it is a tightly-knit turf that has side lateral growth capability, can fill in gaps, which also means it has the ability to mend itself when damaged. The nature of this blend makes an extremely dense and medium-fine textured turf that actively fills in and stays thick. Available in sod (late summer 2019) and seed.